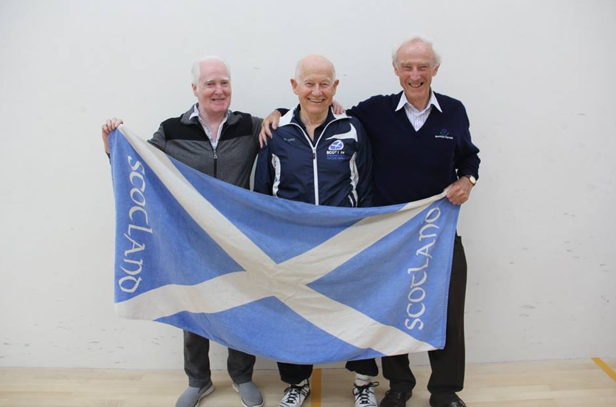 Scotland fielded a very competitive three man team for the Home International at the Aberdeen Squash & Racketball Club. Last year, the team came a very close second to Wales and hoped, with the team of Tom Kane, Vincent Taylor and Andrew Rugg-Gunn, to produce another scare this year. The team got off to an excellent start on the Friday evening with a comprehensive 3-0 win against Ireland, while dropping only three games, and continued their fine play on Saturday morning with a 3-0 win against Wales without dropping a game. This set up a showdown against the powerhouse England side, which included the perennial World Champion, Adrian Wright. Tom Kane put a scare into Adrian with a 10-8 first game win, but Adrian, aided by a 6 year age gap, was too strong in the end. Andrew Rugg-Gunn also went down 3-1, as did Vincent Taylor. So it was not to be. England retained the title they relinquished the previous year to Wales and Scotland maintained its second place in a comprehensive manner. All in all, it was an excellent tournament. 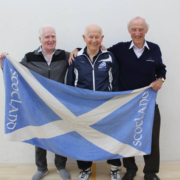 Kudos to the Aberdeen Squash and Racketball Club and to Scottish Squash.